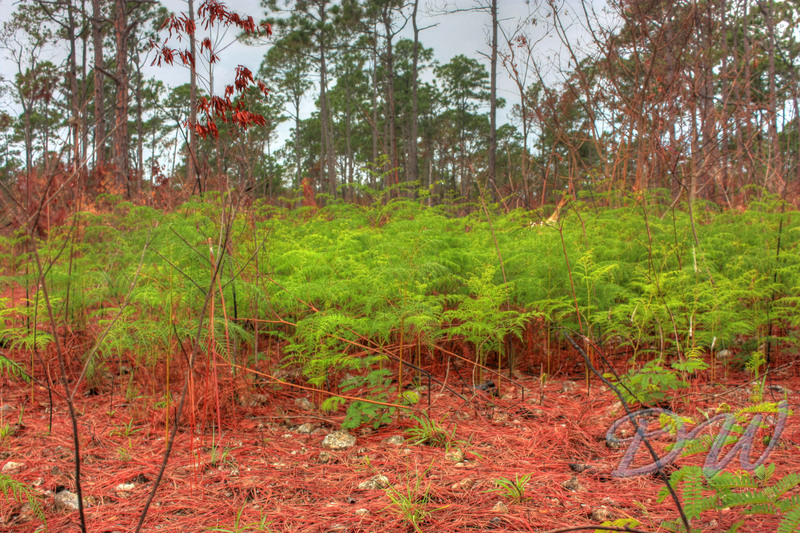 Every year in the Pine Barren Forests of Abaco (and other islands of the Bahamas with pine forests) there is a fire that rages through the underbrush leaving the pines largely untouched. Every once in a while in a certain parts of the island a section that has not had a burn for a while will flare up with intensity that leaves behind an arid eerie landscape of char. 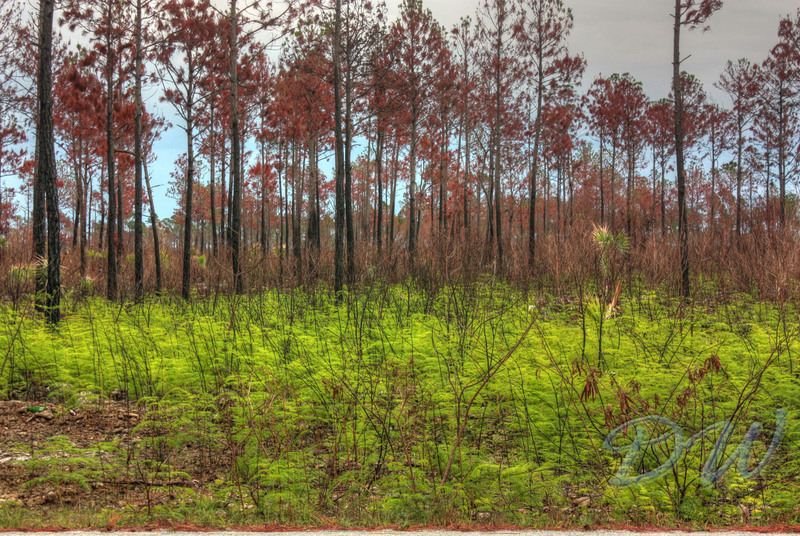 sometimes the flames and heat get so intense they will cook the tops of the pine trees. Miraculously though, the pine trees have developed a genetic ability to withstand the heat and flames and typically continue growing. Something in their bark is flame retardent and the trunk has a very high sap content which must help. The wood is very hard for a pine and great for flooring. There was talk from a small outfit that was going to mill the pines on a small scale and provide flooring and trim once again. 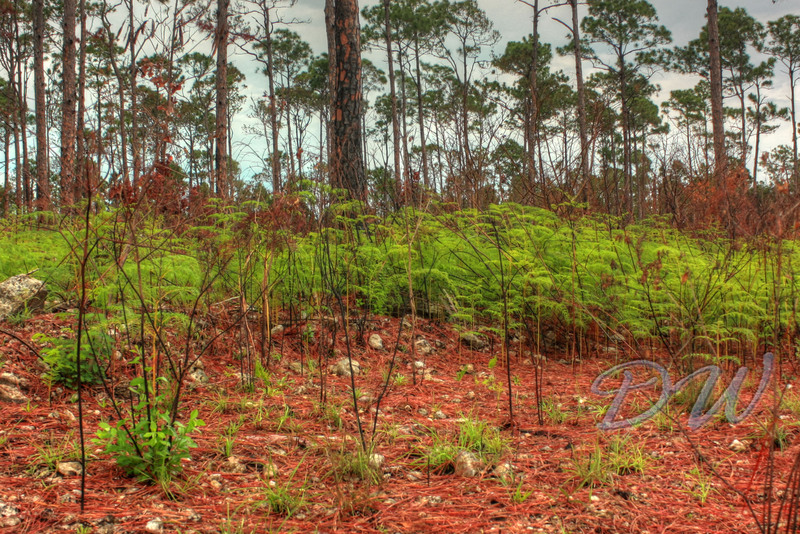 The wood is generally not a uniform grain and shade, but reminds me of knotty cypress without the holes. once varnished it yields a great tone, very warm. 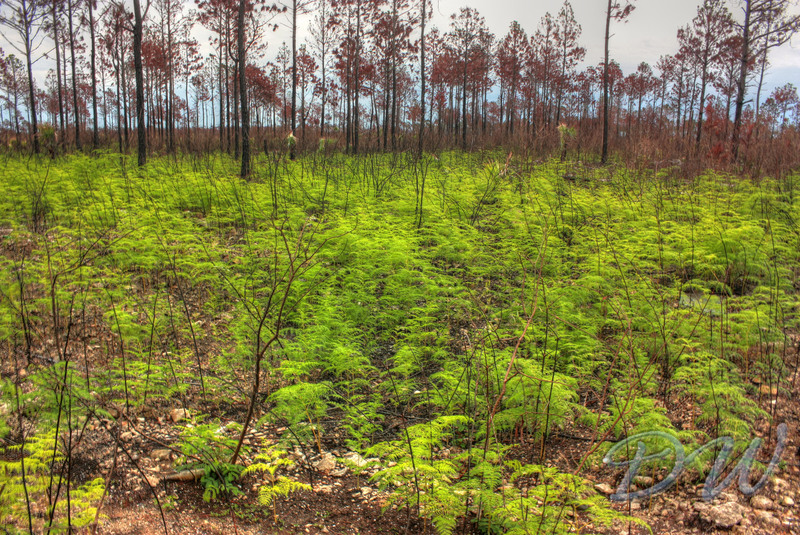 Anyway, right after the burn, within 24-36 hours the bracken ferns will spring up from teh ashes like a forest phoenix and inbue the landscape with a lush, rich vibrant green of life set in the browns, red and blacks of the recently roasted environment. Here are some recent photo i took, but the camera never captures the colours perfectly. These were taken right after a good dousing of rain and the smells are a cacophony of charcoal, sweet fern, like a yin yang mix of life and death. truly awe inspiring and a part of the Bahamas that most people who visit the islands never see. For those folks who live out in the quieter, more peaceful and secluded parts of the Abaco main Island, may cherish their privacy and beauty of nature – it comes with a price. once in a while every couple of years you may have one or two sleepless nights and digging fire breaks while the world flares around you. But a few days later and it is gone and you can relax again, knowing that the area won’t burn again for several years as the flamables have all been burnt up.